Suptek ML5073 Classic Series TV cart is best selling universal TV cart for commercial use of offices, schools, hotels, airports, laboratories, lobbies, hospitals, churches and more. Travel lightly to and from trade-shows and conferences with this versatile and compact TV cart. 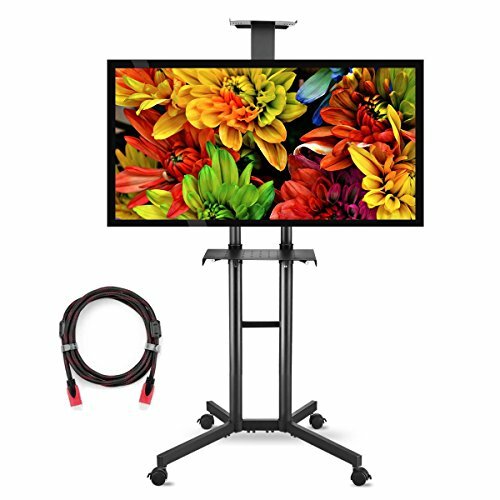 It fits flat panel TVs from 32" - 60" weighing up to 100 lbs. Compatible with all major TV manufacturers. Great stability, security, flexibility, durability with high quality. For outdoor advertisements and activities with convenient movement. Easily moving four universal brakes wheels, free position fixing. 1. Four heavy-duty swivel casters. 2. locking wheels for easy gliding. 3. Compact and simple to travel with, easy to disassemble, base legs fold in and support tubes slide into. 4. Built-in cable management system routes cables neatly. 5. Made of high grade aluminum with durable powder coats finish. 6. Component shelves for holding A/V equipment. 1. Screen: 32" to 60"
*3-YEAR GUARANTEE; If you have ANY issues, please contact us.